Welcome to the Sony connection guide! The process of connecting Cascable Transfer to your camera is usually very simple. This guide will walk you through the steps. Before connecting your camera with Cascable Transfer, check that your camera’s firmware is up-to-date. You can check the version of firmware that your camera is running by selecting Version from your camera’s Toolbox menu. Head over to Sony’s Support Pages and follow the links to your camera’s model to download the latest firmware. Note: You will need a Sony Account to download Sony PlayMemories Camera Apps. In order for Cascable Transfer to talk to your camera, you need to install Sony’s Smart Remote Control app onto your camera. Once Smart Remote Control has launched, press the Delete button to toggle between Display QR code and Connect with a password. Connect to the WiFi network and enter the password that’s display on your camera’s screen. On some older Sony camera models, apps connecting over WiFi, such as Cascable and Cascable Transfer, are not permitted access to the camera’s storage card. This is a limitation of the camera’s firmware, unfortunately cameras shown in our Camera Compatibility table with a dash in the Storage Access column are not supported by Cascable Transfer. 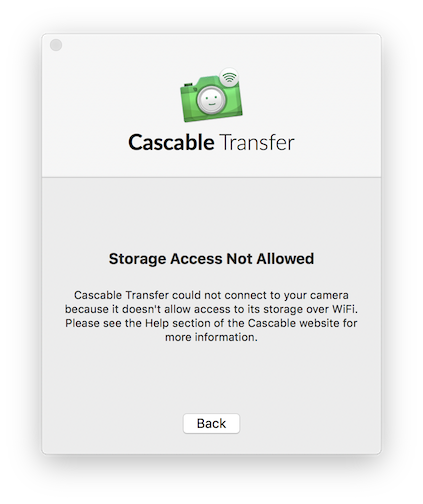 Cascable Transfer’s No Storage Access dialog.